If this is the shape of things to come then I think I’ll make a Goldilocks Cake comeback really soon. My son and I were waiting for her mommy to finish buying some food items we serve our guest in our hostel and this Cake popped out of nowhere. Goldilocks is known to be your grandfather’s cake, meaning, they’re so traditional, the usual, and not exciting at all — if it weren’t for their moist chocolate cakes and other flavors. 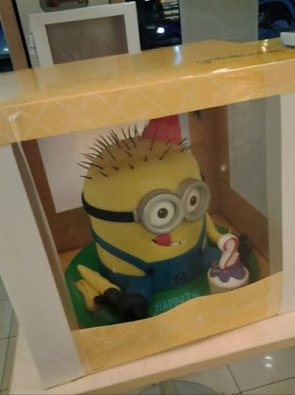 So to see this kind of Fondant Cake in their store means that it is breaking out of their mold and trying out new and exciting stuff that kids and adults would surely order more. I only wonder why they don’t have this kind of Cake posted on their website.